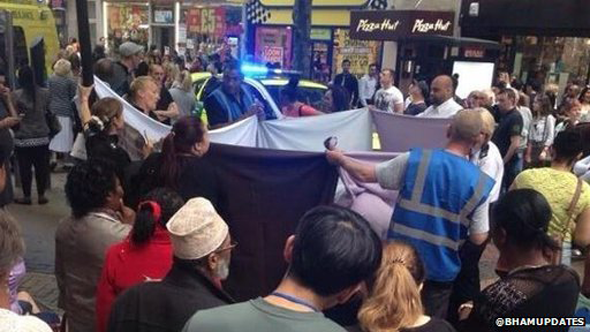 A woman has given birth to a girl in the street outside the Primark clothes shop in Birmingham city centre. West Midlands Ambulance Service confirmed it was called to New Street at about 14:00 BST. Security staff held up a sheet around the woman to give her privacy, as dozens of shoppers gathered to watch events unfold. An ambulance spokesman said mother and baby were "OK" and had been taken to City Hospital for check-ups. Nadia Hussain, a worker at nearby clothes store Gossip, witnessed the aftermath of the birth and said the mother was showered in money before being whisked off to hospital. "Everyone was crowding the woman and after about five minutes everyone was clapping," she said. "Everyone was throwing money at her. She got about £300 to £400. The mother was waving at everyone, telling everyone to film her. Everyone had their phones out and she was waving at them as she went into the ambulance." 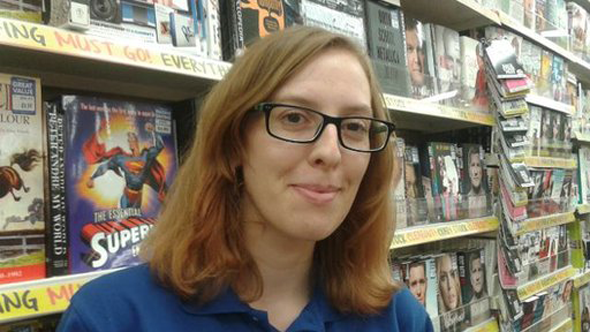 Rachel Trombley, a worker at bookshop The Works, said: "We saw a massive crowd congregating outside and we thought when the ambulances pulled up someone must have fallen over, or had a heart attack. "Then the crowd were cheering so we thought it must be something positive. The crowd suddenly cheered. "A lot of people were saying, 'ahhh'."